You are here: Home / Ethnic Groups / The People of Kalimantan / Who are the Dayak Pasir? Who are the Dayak Pasir? The Dayak Pasir are the original inhabitants of the Pasir Regency in the province of East Kalimantan. Based on their living areas, the Dayak Pasir consist of five sub-groups: (1) The Pasir Telake who live along the Telake River; (2) the Pasir Adang who live along the Adang River; (3) the Pasir Kendilo whose living area stretches from the source of the Kuaro River to the mouth of the Pasir River; (4) the Labuan, who live in the village of Labuan; and (5) the Pasir Tanjung Aru, who live in the Tanjung Aru area. The Pasir live side by side with other groups, particularly the Banjar, Bugis, and Jawa peoples. They speak the Dayak Pasir language, which has 12 dialects. Some of the Dayak Pasir live in villages along rivers, while others live in remote places in the middle of the jungle. Groups of extended families make up the villages, which each have 20-30 people. The typical distance between houses is around 300 meters. Most of the Dayak Pasir area is a low plain. The southern portion is primarily marsh land and a hilly, mountainous area is in the west. The Dayak Pasir area has many rivers, which are the primary means of transportation. The forest area of 1,149,000 hectares is used for a variety of needs. The Dayak Pasir lineage of descent is ambilineal (traced through the father and/or the mother). Some of them practice migratory agriculture because they cannot maintain the soil’s fertility. New farmland is opened by cutting down trees and burning the underbrush. Farmers grow many crops, including rice, corn, pepper, and lentils. The Pasir also make their living from palm oil and rubber plantations. Some of the Dayak Pasir work as collectors of resin, rattan, gaharu wood, honey, and walet bird nests. Others make their living producing coconut palm sugar. 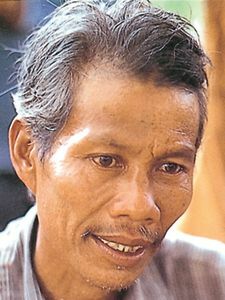 Generally, the Dayak Pasir are Muslims. However, in some cases, they still follow their ancestors’ beliefs in the area of medicine and fertility. At harvest time, the Dayak Pasir give an offering to Sang Hiyang (god of fertility) accompanied by the chanting of spells. They also perform besoyong, a prayer ceremony asking the spirits of their ancestors to guard them at home and in the field. According to initial information, the Dayak Pasir people were easily reached by the Gospel. According to this data, more than 2,000 people have been reached with the gospel. There are three church congregations whose majority are Dayak Pasir. However, there are many cases of Dayak Pasir Christians who marry into the Islamic faith and become Muslim. The rich natural resources and fertile lands of the Dayak Pasir do not automatically make their life better. The income they earn is sufficient only for their own daily needs. One reason for this is because their means of transportation is limited. This makes it difficult for them to distribute their products to the markets. A lack of capital also hampers their business efforts.